Product #1839 | SKU 577 | 0.0 (no ratings yet) Thanks for your rating! The Manfrotto 577 Rapid Connect Adapter gives you the freedom to remove the camera from the head without detaching it from the plate. It includes the 501PL plate and is compatible with the 501PLONG camera plate as well. 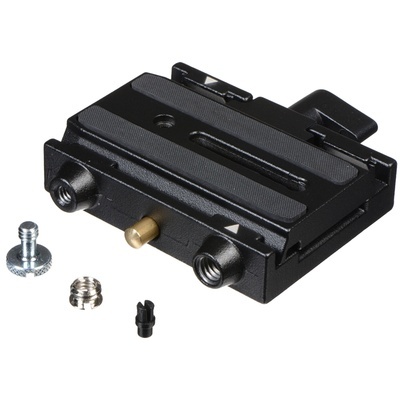 A 1/4"-20 screw and a 3/8"-16 bushing are included so you can use the plate with various cameras. Corresponding threaded holes on the side of the adapter allow you to store the screw that is not being used, so you can access it if and when you need it.